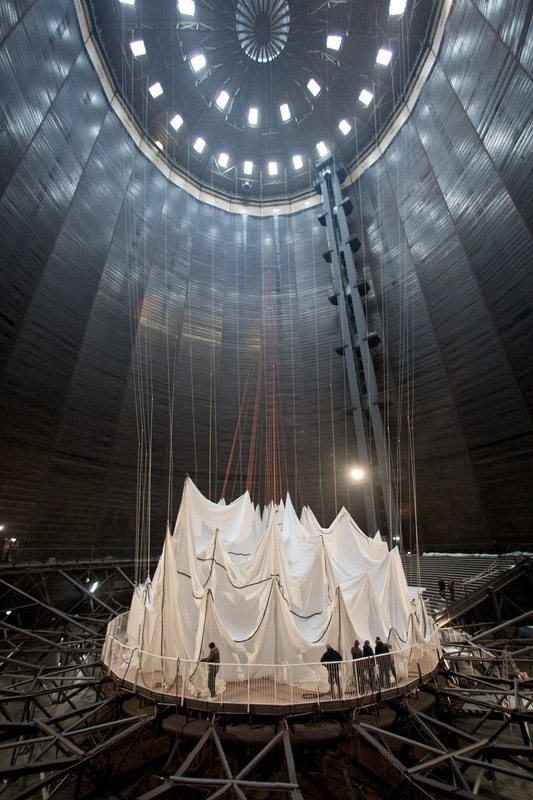 Christo, Big Air Package, Gasometer Oberhausen, Germany, 2010-13, Photo: Wolfgang Volz © 2013 Christo. Quatorze anos depois de mostrar ‘The Wall’, durante a Emscher Park International Building Exhibition, o aclamado e, também, controverso artista Christo apresenta uma nova intervenção escultórica criada, especificamente, para o Gasometer Oberhausen. ‘Big Air Package’ é uma escultura de 90 metros de altura montada no interior do antigo gasómetro que mede 117 metros de altura. É a maior escultura (interior) realizada até ao momento. 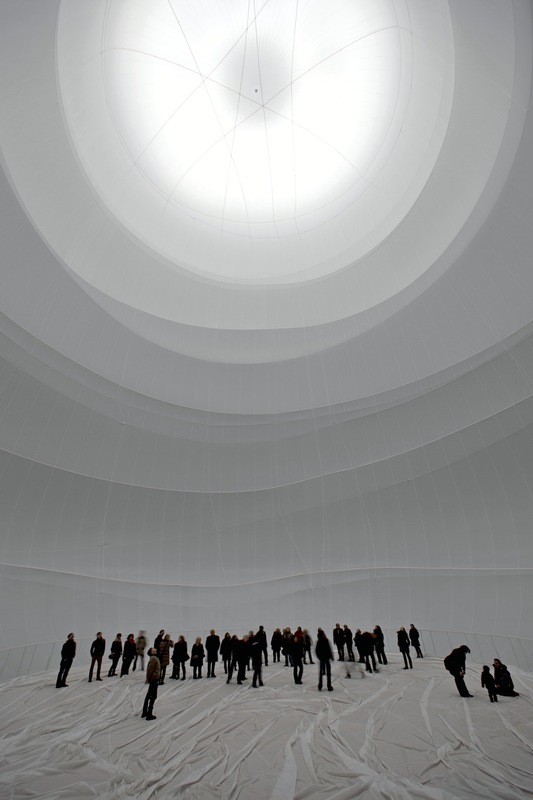 Este projecto foi concebido por Christo, em 2010, para o Gasometer Oberhausen – um gigantesco edifício industrial, localizado na cidade Alemã de Oberhausen, que faz parte da European Route of Industrial Heritage (Rota Europeia do Património Industrial). A escultura foi instalada no interior de um antigo tanque de gás e foi construída a partir de 20.350 metros quadrados de tecido (poliéster) semitransparente e 4.500 metros de corda. Concluída ficou com 90 metros de altura e 50 metros de diâmetro, pesa 5.3 toneladas e tem um volume de 177.000 metros cúbicos. Dois ventiladores de ar criam uma pressão constante de 27 Pascal (0,27 mbar) para a manter vertical. Os visitantes podem entrar dentro da escultura que é iluminada pelas clarabóias do gasómetro e por 60 projectores adicionais, criando uma luz difusa no interior. Trata-se de uma experiência tridimensional fantástica (forma, luz e espaço). Christo e Jeanne-Claude realizaram a sua primeira escultura, envolvendo ar, em 1966, em Eindhoven, na Holanda. A última foi apresentada na Documenta de Kassel (IV), em 1968, tinha 85 metros de altura, 10 metros de diâmetro e um volume de 5.600 metros cúbicos. 14 years after showing “The Wall” during the Emscher Park International Building Exhibition, Christo today presented a new extraordinary work of art created especially for the Gasometer Oberhausen. 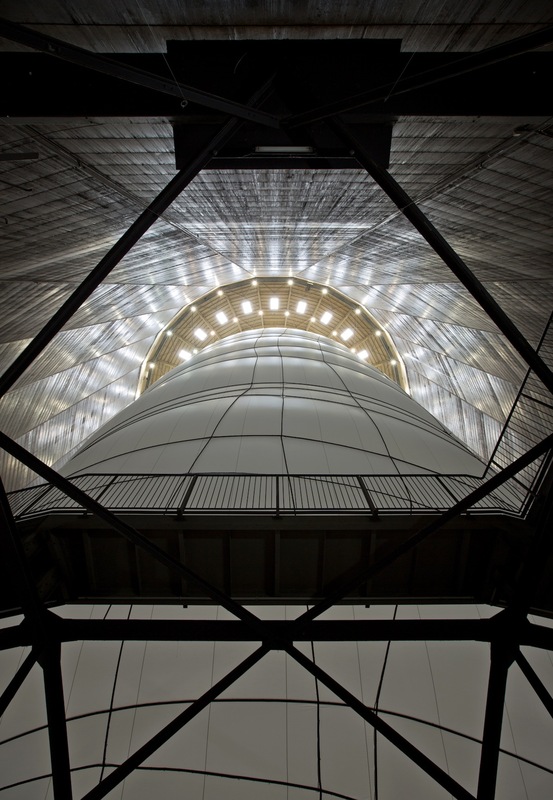 The internationally acclaimed artist installed his “Big Air Package” inside the 117-meter-high industrial building. It is the largest indoor sculpture ever made. 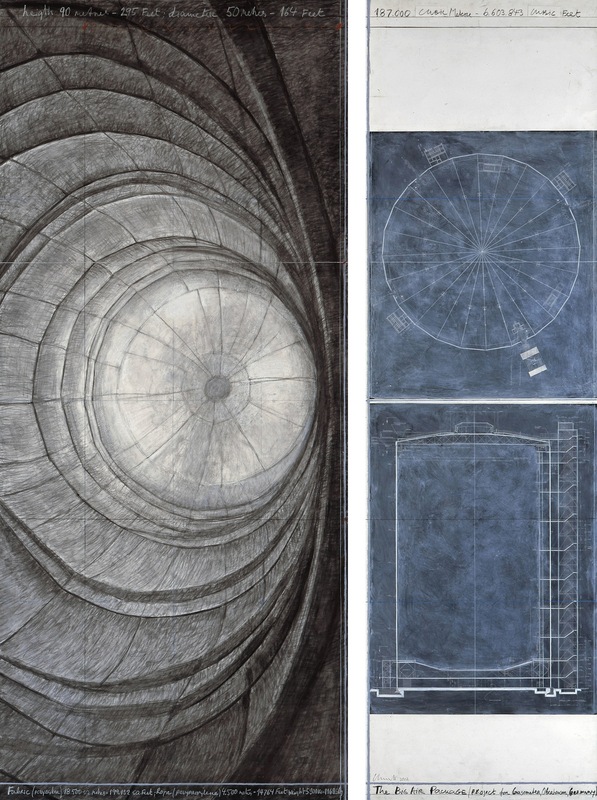 “Big Air Package, Project for Gasometer Oberhausen, Germany” was conceived in 2010 by Christo and will be on view from March 16 to December 30, 2013. The sculpture, which is installed inside the former gas tank, was made from 20,350 square meters of semitransparent polyester fabric and 4,500 meters of rope. 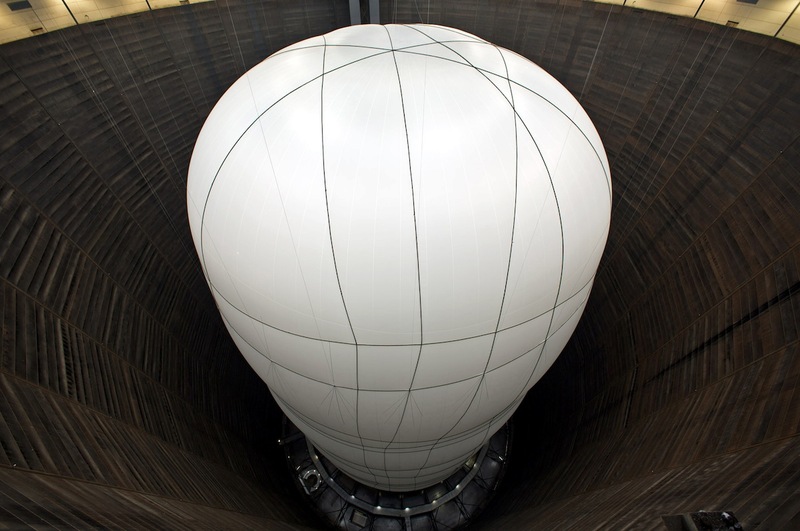 The inflated envelope is 90 meters high and 50 meters in diameter. It has a total weight of 5.3 tons and a volume of 177,000 cubic meters. The ‘Big Air Package’ nearly spans the distance from wall to wall of the Gasomter, leaving only a small passage to walk around the sculpture. Two air fans creating a constant pressure of 27 pascal (0.27 millibar) keep the package upright. Airlocks allow visitors to enter the package. Illuminated through the skylights of the Gasometer and 60 additional projectors, the work of art creates a diffuse light throughout the interior. Inside the sculpture, an extraordinary experience of shape, space and light is provided. Christo and Jeanne-Claude realized their first sculpture involving air in 1966 in the Dutch town of Eindhoven. Their last air package was erected at documenta IV in Kassel in 1968. It stood 85 meters tall, with a diameter of 10 meters and a volume of 5,600 cubic meters. Wolfgang Volz, who helped realizing many of Christo and Jeanne-Claude’s past projects, is the project director for the ‘Big Air Package’; Peter Pachnicke is the curator of the retrospective exhibition.